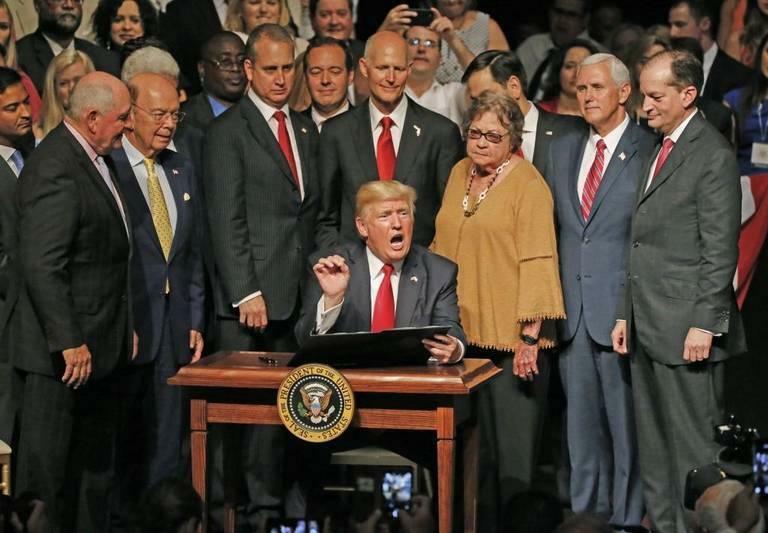 Trump signed the directive about Cuba policy Friday in front of a supportive crowd at the Manuel Artime Theater in Little Havana. 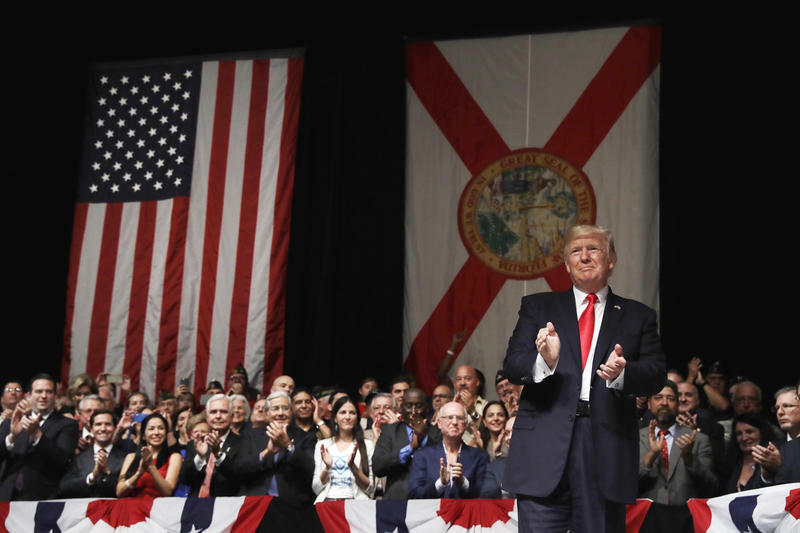 President Donald Trump addressed an enthusiastic crowd at the Manuel Artime theater in Little Havana. 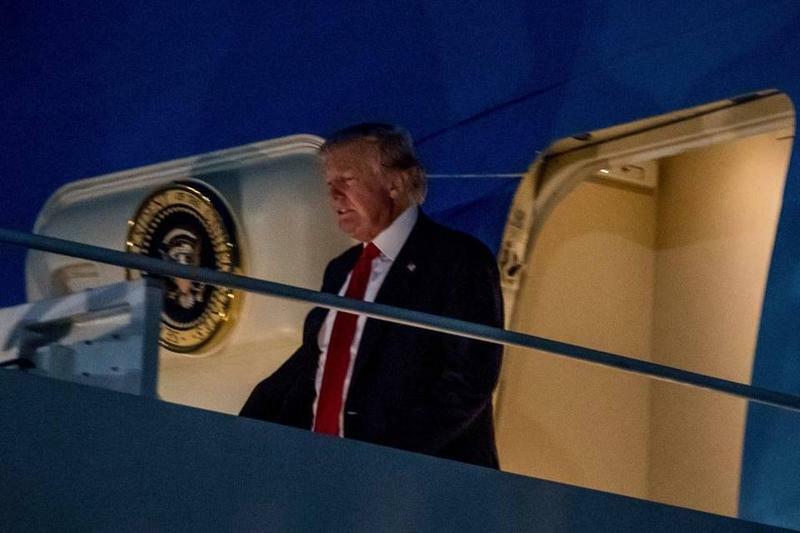 President Donald Trump Friday announced new restrictions on travel and business with Cuba, reversing some of the relaxed new relations instituted two years ago by President Barack Obama. "Effective immediately, I am canceling the last administration's completely one-sided deal with Cuba," Trump said. "It's hard to think of a policy that makes less sense than the prior administration's terrible deal with the Castro regime," he said "They made a deal with a government that spreads violence and instability in the region." 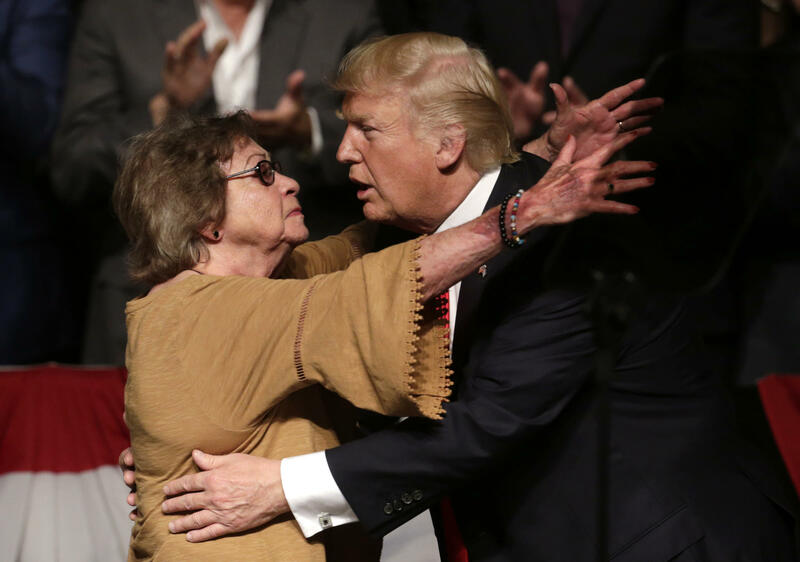 President Donald Trump hugs Martha Beatriz Roque, a Cuban dissident, on Friday. "Our policy will seek a much better deal for the Cuban people and the United States of America," he said. "Our new policy begins with strictly enforcing U.S. law." He also called for the release of political prisoners and the scheduling of free elections. "We will enforce the ban on tourism. We will enforce the embargo," he said. "We now hold the cards. The previous administration's easing of restrictions on travel and trade does not help the Cuban people. 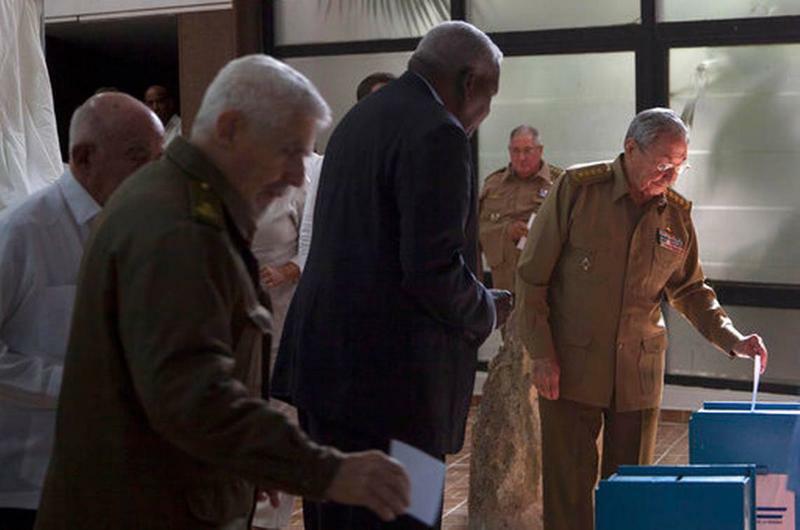 They only enrich the Cuban regime," he said. "The profits from investment and tourism flowed directly to the military." The new moves primarily affect anyone doing business with the Cuban military, which controls some of the major tourism infrastructure in the country, as well as individual travelers who were able to visit the country more freely under "people-to-people" exchanges. Protestors opposed to President Donald Trump and his policies were outside the theater Friday. Trump announced the changes in front of a supportive crowd at the Manuel Artime Theater in the heart of Little Havana. The theater is named in honor of a leader of Brigade 2506, who participated in the Bay of Pigs invasion of Cuba in April 1961. "We will work for the day when a new generation of leaders brings this long reign of suffering to an end," Trump said. "And I do believe that end is in the very near future." He challenged Cuba to "come to the table" for a new agreement that was in the best interest "of their people and our people and also Cuban-Americans." "Stop jailing innocent people. Open yourselves to political and economic freedoms," he said. "Return the fugitives of American justice." "When Cuba is ready to take concrete steps to these ends, we will be ready willing and able to come to the table to negotiate that much better deal for Cubans and Americans," he said. "Our embassy remains open in the hope that our countries can forge a much stronger and better path." Sen. Marco Rubio praised his onetime rival for the Republican Presidential nomination. "You will no longer have to endure the spectacle of an American president doing the wave with a ruthless dictator in a baseball game," Rubio said, referring to Obama's historic visit to Cuba last year. "This sends a strong message," Rubio said. "We will work with the people of Cuba but we will not empower their oppressors." Florida Gov. Rick Scott also praised Trump's changed position. "Today we have a president that understands America must stand for freedom," Scott said. He said Obama's deal with Cuba was "a capitulation." Trump's new directive leaves many of the Obama-era policies unchanged. The new embassies in Cuba and Washington, D.C. will remain open and the wet-foot dry-foot policy will not be reinstated. Cuban-Americans will continue to be able to travel to the island and send remittances to their families still in Cuba. The crowd at the theater in Little Havana were appreciative of Trump. Fermin Vazquez was born in Cuba and has been a U.S. citizen for 40 years. He arrived at 6:45 a.m. to be first in line. "I would follow Trump everywhere," he said. Oswaldo Inguanzo, 80, a veteran from Brigade 2506, was part of the group that met with candidate Trump last year to discuss Cuba and America's approach to the island. "The Brigade had never supported a presidential candidate before," he said. "But we sent two letters, one to the then-President Obama, who didn't even acknowledge us, and the other to Trump, who immediately accepted." "He didn't disappoint me," Inguanzo said after Trump's speech. "I felt he was sincere, so I came here today to see that he fulfills his promise." Outside near the theater, people began gathering hours before Trump arrived. Some waited out the rain under awnings and overhangs. Others allowed themselves to be soaked. Marla Recio said she has a business in Cuba called Havana Reverie. It organizes weddings, birthday parties and corporate events for visiting Americans in Cuba. "If he decreases travel and cuts that out completely, that means the end of my business. I'll have to do something else in another different industry. Right now, most of Cuban entrepreneurs are relying a lot on American visitors," she said. "The Cuban people are the ones that are going to be harmed, the ones that are going to suffer. And all of the families that depend on those businesses." 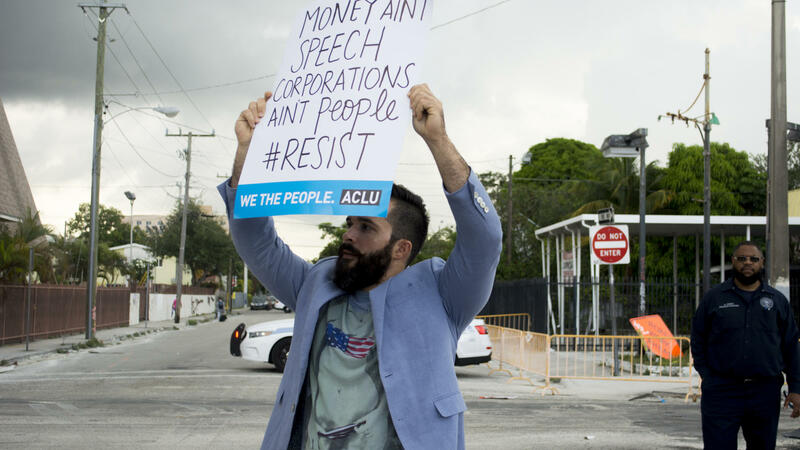 Ernesto Medina protested outside the theater Friday where Trump was speaking. He said he opposes the rollback to Obama's Cuba policies. Ernesto Medina is with the People's Progressive Caucus of Miami-Dade. "I think what President Trump is doing, rolling back the policy that President Obama implemented, it's going to hurt business in Cuba," he said. "A lot of jobs have been created in the private sector to serve the people traveling to Cuba. That increases the prosperity of the Cuban people, which is what we all should want to the Cubans." Medina said he also objects to what he called the "hypocrisy" of Republicans who tout the benefits of small government. 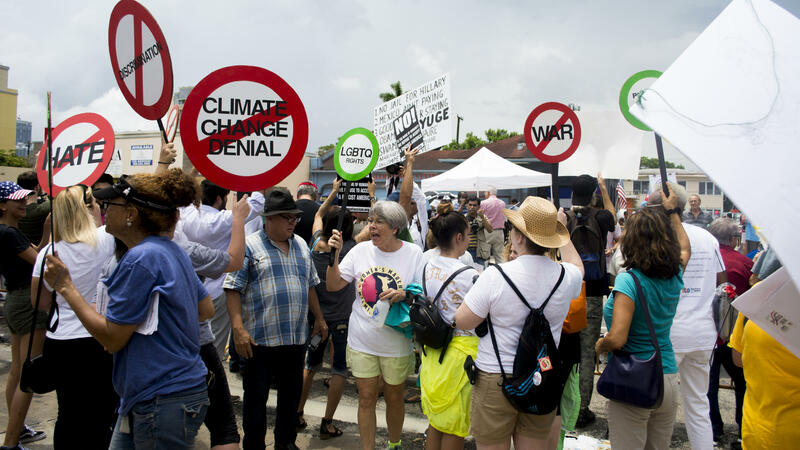 "Now they're going to be scrutinizing every single American citizen that travels to Cuba, to see which category they fall under to go there," he said. "This is an infringement of personal freedoms. We should be able to travel anywhere we want." Some of those gathered outside the theater supported Trump. But Laura Vianello, a Cuban exile who has lived in Miami since 1960, said she wished he was doing more. "I noticed that Trump has become more of a politician than what we expected from him — to be himself," she said. "We really liked the man because he has a mind of his own, but we expected more." Across the street, an anti-Trump protester disagreed. Bernardo Guitierrez, 70, was also born in Cuba. He said Obama's policies had helped Cubans. "I visit Cuba because I still have family there, and I know they're doing much better," he said. "Little by little, but better." Jorge Naranjo was at Versailles restaurant on Friday. He came from Cuba in 1994 and hasn't been back. Cuban exiles also gathered at some of the restaurants on Calle Ocho that have become synonymous with Little Havana. Jorge Naranja was at Versailles. He said he voted for Trump in November — but he doesn't think the policy changes announced on Friday will lead to meaningful change in Cuba. 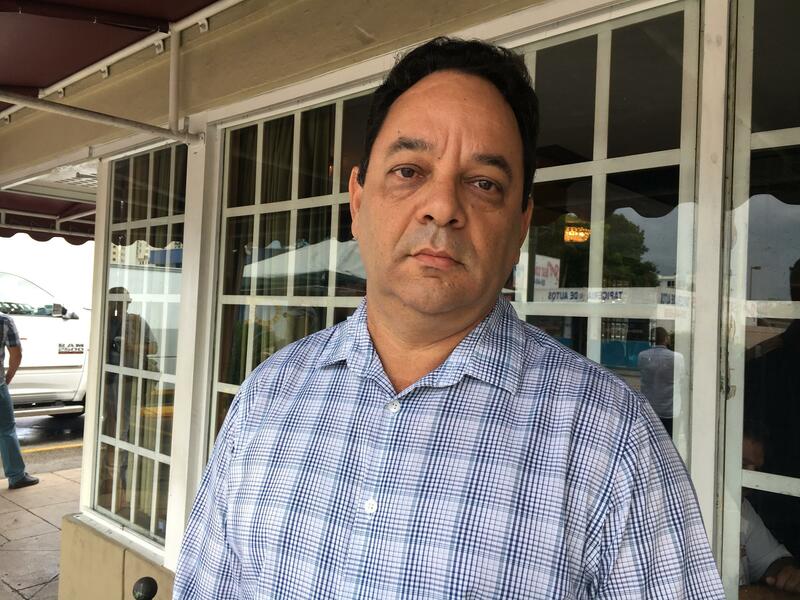 He came from Cuba in 1994 and he hasn't been back since, because he thinks any kind of travel there will just "inject money into the system," he said. He said he'd like to see the U.S. either close the door completely to Cuba, or open up 100 percent if it gets a good offer from the Cuban government — but he doesn't expect that to happen. HAVANA — Cuba is starting an electoral process that is expected to end with President Raul Castro stepping down in February. The Council of State says in Wednesday's state media that voting for municipal assemblies will take place on Oct. 22. It doesn't set the date of voting for the country's parliament, which selects the Council of State and the president. Elections are held every five years. Castro has said he'll step down as president in February, although he is expected to remain head of the ruling Communist Party. I don’t usually feel sorry for Central American heads of state. Too many of them, right-wing or left-wing, have done their damnedest to perpetuate the image of the corrupt, tin-pot strongman.